One of the world's best effects packages. NewBlue Elements 3 Energize offers 6 compositing tools to give energy to and creatively redesign your images.Create vivid backgrounds, simulate camera shake, create mirror reflections or replicate your video in a video screen with beautifully controlled image variations. HitFilm is one of the world's best effects packages and lets you transform a clip from your video footage into a stunning film scene. Together with FXHOME we're offering this high quality effects package including 10 plug-ins for free! The ultimate achievement After 10 years of development, Video Pro X now becomes one with your computer. Experience the full power of Video Pro X for the first time with 100% hardware acceleration. 100% design freedom. For movies created 100% according to your ideas. Entertain your viewers using the brand new dynamic titles. Have individual letters or words appear anywhere onscreen to add a special touch to opening and credits. For impressive videos from start to finish. We work directly with professional Video Pro X users to improve performance and functionality and achieve a truly perfect workflow. The latest program features include the time-saving color picker tool and comprehensive track handling. You can now select a specific shade of color with a single click. The new color picker contains a wide spectrum of colors and works in realtime, so finding the exact shade you need is a cinch. The color picker can detect color from any image area where you move your mouse. Track handling has been optimized in Video Pro X: Tracks can now be reordered, deleted and copied – even retroactively. Use the active target track to import media such as video or music with absolute precision to the position you want on the Timeline. New track and object color schemes provide a clearer overview – you can give elements the same color in order to group and sort them in a clear and organized way. The new, flexible grouping options for video and audio tracks. Tracks can now be modified individually without losing the advantages of working with grouping. The new J-L cut – an impressive time-saver for overlapping objects such as spoken audio which spans several scenes in documentaries and interviews. The Media Pool from previous versions has been modernized and feature a range of improvements to workflow. The plug-in dialogs have also been revamped using the latest GUI technology. Edit videos faster than ever before: Tap into the full potential of your CPU and GPU! Enhanced NVENC support for NVIDIA and AVX-optimized algorithms give Video Pro X a performance-enhancing boost that you'll notice right away. Speed up your workflow with the new chapter export function. Save time by batch converting and exporting individual chapters as you edit them, instead of your entire movie. Get more power from your CPU. Video Pro X's comprehensive AVX optimizations for internal image processing and 3-way color correction make processing much faster, deliver much more precise output quality on color conversions and free up resources for the use of additional effects. Video Pro X now offers accelerated export times – thanks to improved NVENC support from NVIDIA. As a result, outsourcing export to NVIDIA GPU encoders can be now done at least twice as fast as before. High speed performance for brilliant results. Experience smoother playback for 4K material, up to five times faster processing and Intel GPU hardware acceleration for HEVC and H.264. with optimized Video Pro X performance. Video Pro X is ready for the 6K age. Edit 6K videos with the new Panasonic LUMIX GH5 or other 6K-enabled cameras in Video Pro X. The program includes import support for the GH5 in addition to special 6K film & project presets. For the first time, important internal color grading workflow processes have been switched from 8-bit to 16-bit deep color. 16-bit deep color processing allows for detailed color grading and even more freedom for correcting color. Experience natural looking, brilliant images without disruptive color gradient levels. Video Pro X captivates users with the latest technology, attention to detail and functionality. The quality of previous versions has been brought to a whole new level in this version, which works seamlessly with the latest camera hardware. Experience playback at an impressive level of quality. Video Pro X now includes support for HDR (High Dynamic Range) colors. HDR preserves natural contrasts in videos and accurately reproduces original variations in brightness, even for very bright or dark footage. Impressive color extraction lets you make every detail shine and create a lasting impression. With HDR10, Video Pro X supports the latest standards and color gamut BT.2020 and 10-bit color depth in HEVC codec. Bring your projects to life in impressive quality. Less sparkle and fewer Moiré patterns when playing 4K source videos in Full HD. 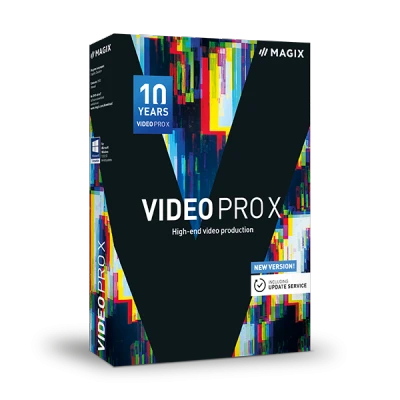 The latest edition of Video Pro X has been developed to significantly reduce image artifacts during the compression of high-resolution videos. The solution: reducing the high-frequency portions of the image. It works! Object extraction Exactly like you'd imagine. Video Pro X's new object extraction algorithm makes it possible to recognize and extract objects from videos. Plus, the reliable antispill feature for removing green edges can now also be used in template mode. Chroma keying at its best! The whole nine yards With the addition of three new features, our 360 editing package is now complete: take advantage of 360 image stabilization, a set of spectacular 360 transitions, and special 360 effects from HitFilm. And now even stereoscopic videos can be processed by Video Pro X. Don't have a 360° camera yet? You don't know what you're missing! State-of-the-art effects Enjoy a new level of user-friendliness and simplicity with the new effects area — designed using the latest GUI technology. Quickly navigate to the effects you want. Easily control the plug-in dialogs. And browse to your heart's content through the wide range of effects in our in-app store. Your movies can now take on any desired appearance. Lookup tables (LUTs) simulate color temperature, Gamma, brightness & contrast from famous films or other footage. Video Pro X includes several LUTS. Additional tables are available for free online, and you can create and save your own. Fast and efficient editing. Even on demanding projects. More vibrant. More powerful. More intense. In one word: brilliant. Optimize the colors in your movie with our new color value correction tool, broadcast coloring and LAB color space coloring. Achieve maximally sharp edges and lines with the high-quality "unsharp mask" feature and get a retro film look with the grain effect. From now on you can use the portrait format recordings from your smartphone without compromising your video's look. The new image border effects ensure perfect integration. Format and design title elements by using image positioning, shadow gradients and 3D effects, as well as templates for inserts, scrolling titles and captions. All templates can be manually adjusted. The slow motion feature allows you to create slow motion with smooth transitions and control speed precisely using keyframes. And frame interpolation provides the best image quality. Simply select parts of the image using alpha masks, then apply the desired effect to these areas. This tool makes it possible to use more detailed effect editing and selective blurring. All the new features contained in previous Video Pro X versions at a glance! The road to the powerful new anniversary edition.